Wash the rice and mung dal well and let soak for a few hours, when possible. (Soaking lentils increases their digestibility and prevents gas from accumulating). In a saucepan over medium heat, heat the ghee or oil and add the mustard seeds, cumin seeds and hing. Stir until the seeds start to pop. Turn off heat and allow this mixture to cool momentarily. Add the rice, mung dal, turmeric and salt and stir until well blended with the spices. Add the water and, turn the heat back on and bring to a boil. Turn the heat down to low, cover and cook until kitchari is tender, about 20-25 minutes. 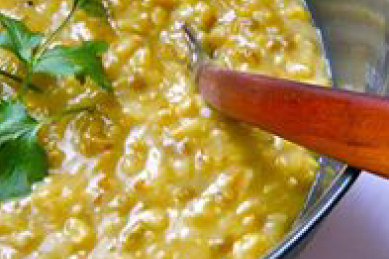 ~ This kitchari can be eaten by all doshas but is especially good for Vata. ~ For Pitta individuals, 2 tablespoons of freshly grated ginger, 2 tablespoons unsweetened, shredded coconut and 1 handful of cilantro leaves can be mixed in the blender and added after spices have finished sautéing. ~ For Kapha people, 4 bay leaves, ¼ teaspoon cinnamon, ¼ teaspoon clove powder, ¼ teaspoon cardamom powder, 2 tablespoons freshly grated ginger, or ¼ tablespoon black pepper powder can be added at the time of sautéing the spices. ~ Specific vegetables for your body type can be added as well, when the rice and dal are about half way cooked. Popular choices include carrots, broccoli, sweet potatoes, green beans and cauliflower.